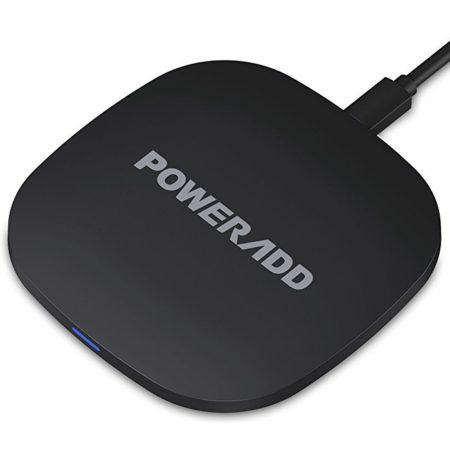 This USB power adapter includes an anti-slip charging stand, making it more convenient and well-organized for charging multiple devices simultaneously. 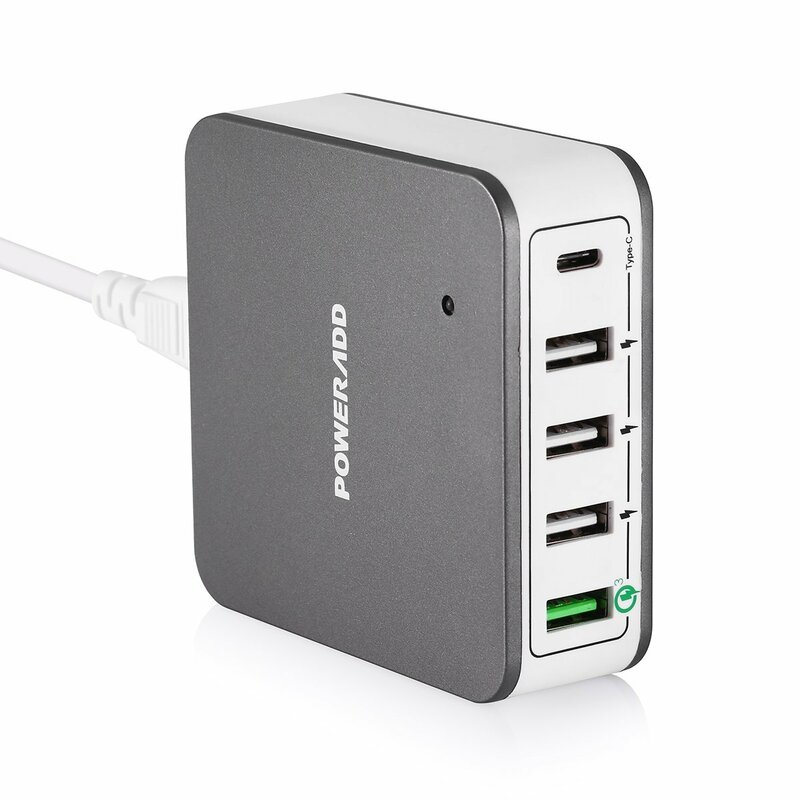 — Powerful USB Charger : 1 USB Type C port, 1 Quick Charge 3.0 port and 3 USB ports pump out 40 watts of power, enough to simultaneously charge several different USB devices. 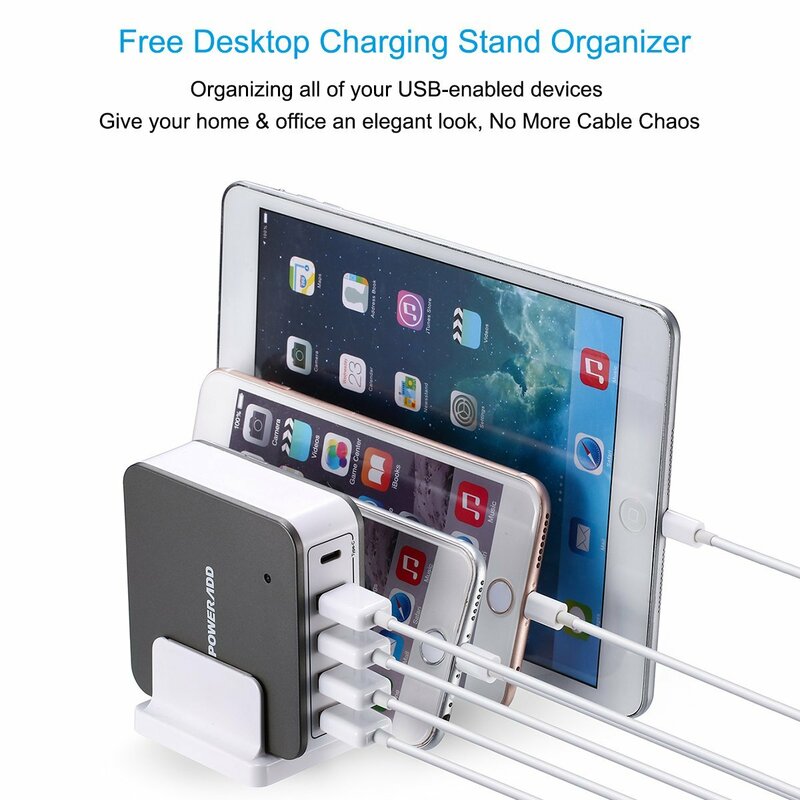 Comes with a desktop charging stand for your USB-enabled devices. — Worldwide 100-240V AC input voltage. 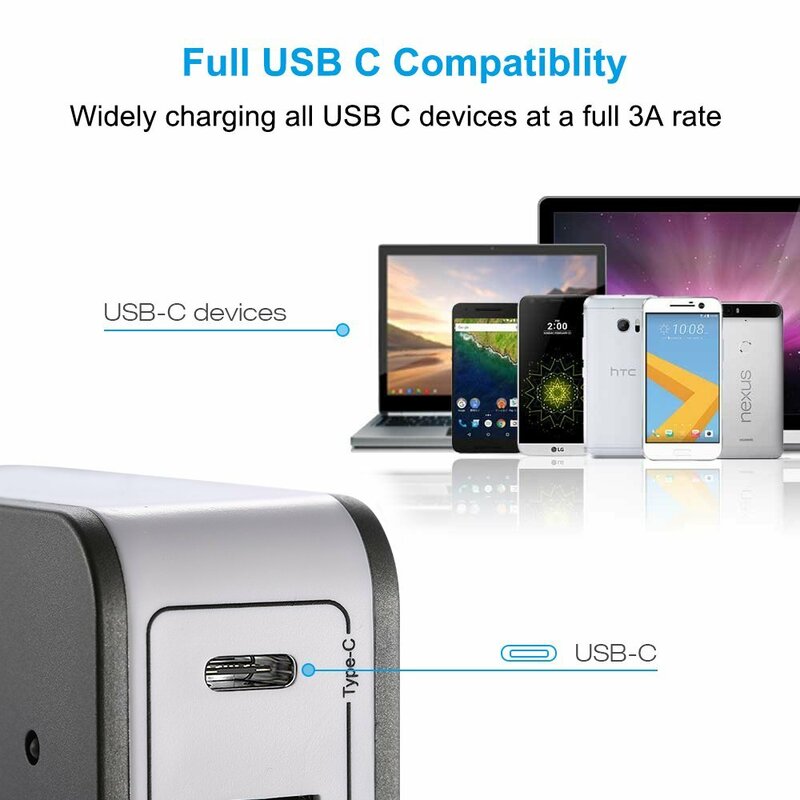 — USB Type C Chargers: Widely compatible with all USB C devices. 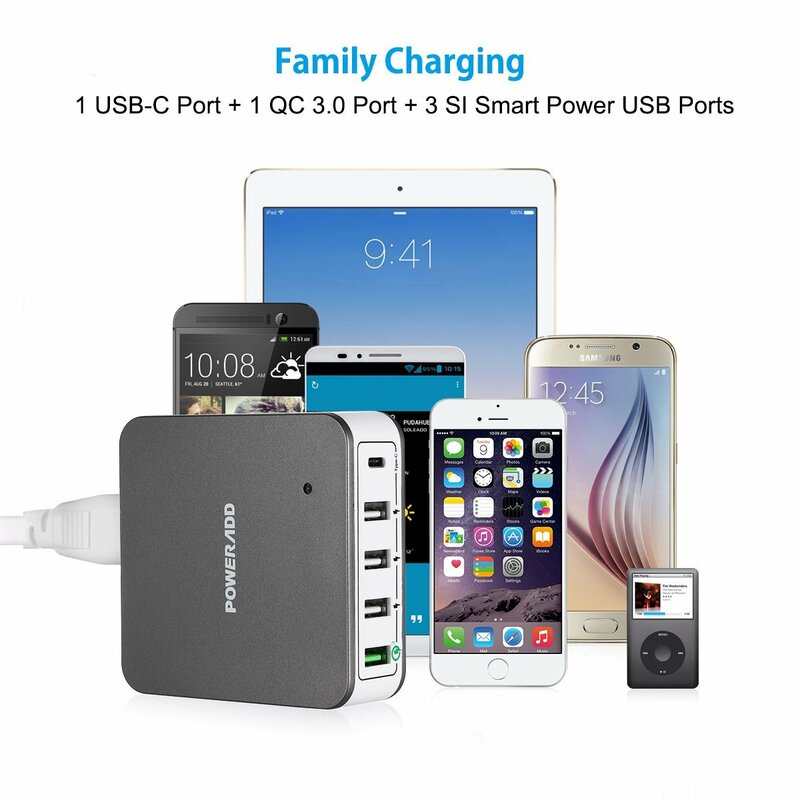 Up to 3A high charging spend. 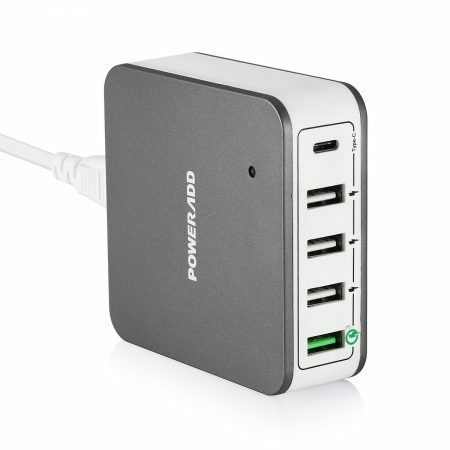 Support Nexus 5X/6P, Nintendo Switch, Pixel C, Lumia 950/950XL, Nokia N1, Chromebook Pixeland other USB C devices. 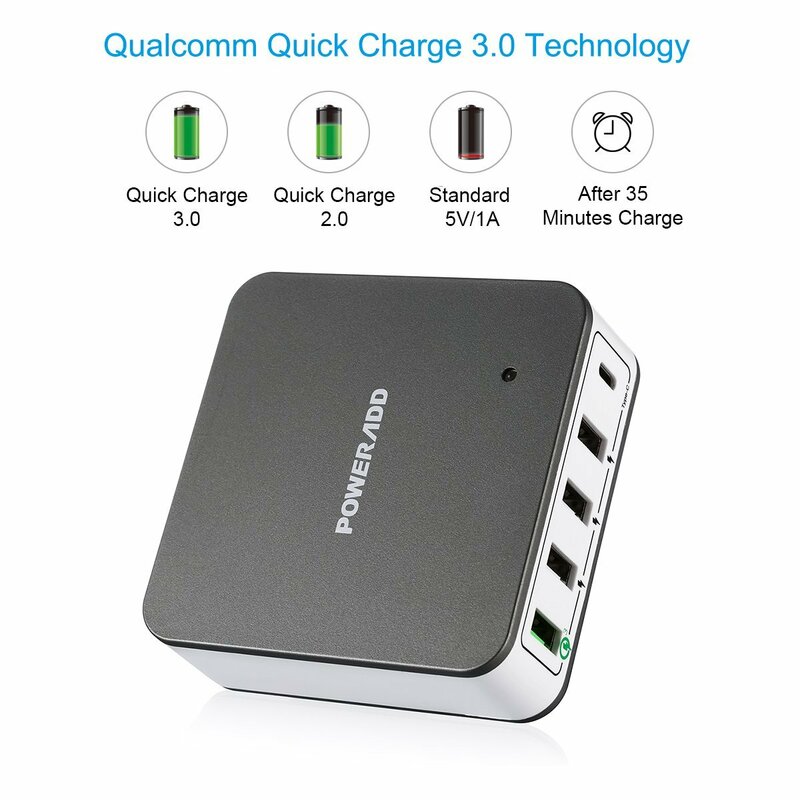 — Qualcomm Quick Charge 3.0: High efficiency, charge your device battery from 0% to 80% capacity within 35 mins, 4 times as fast as standard chargers, twice as fast as QC 1.0, faster than QC 2.0 by 38% in efficiency. Backward compatible with QC 1.0 and 2.0 devices. 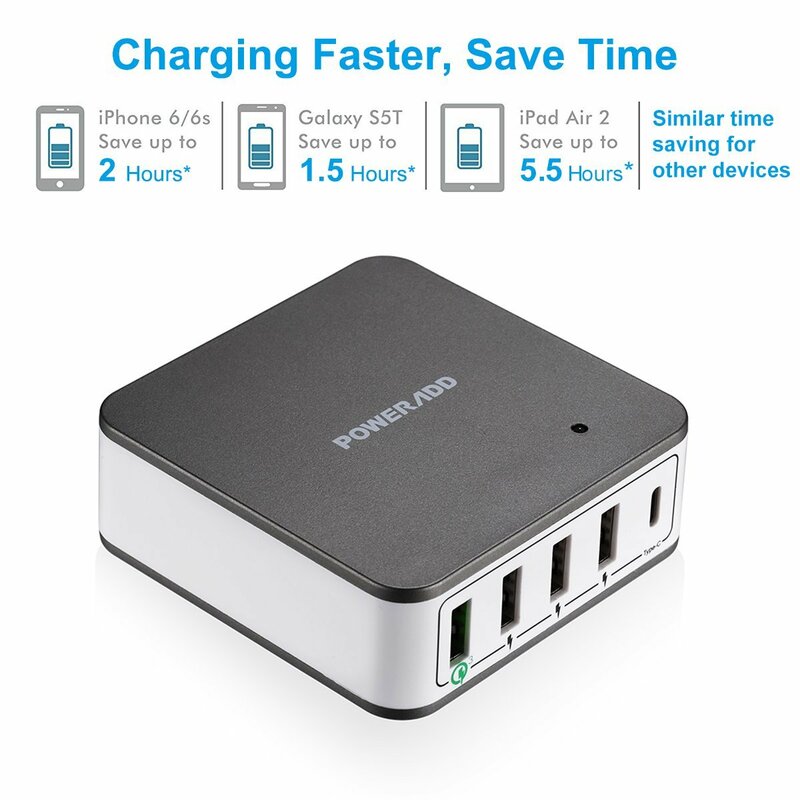 — Fast USB Charging Station: Built-in SI Smart Charging Chip. 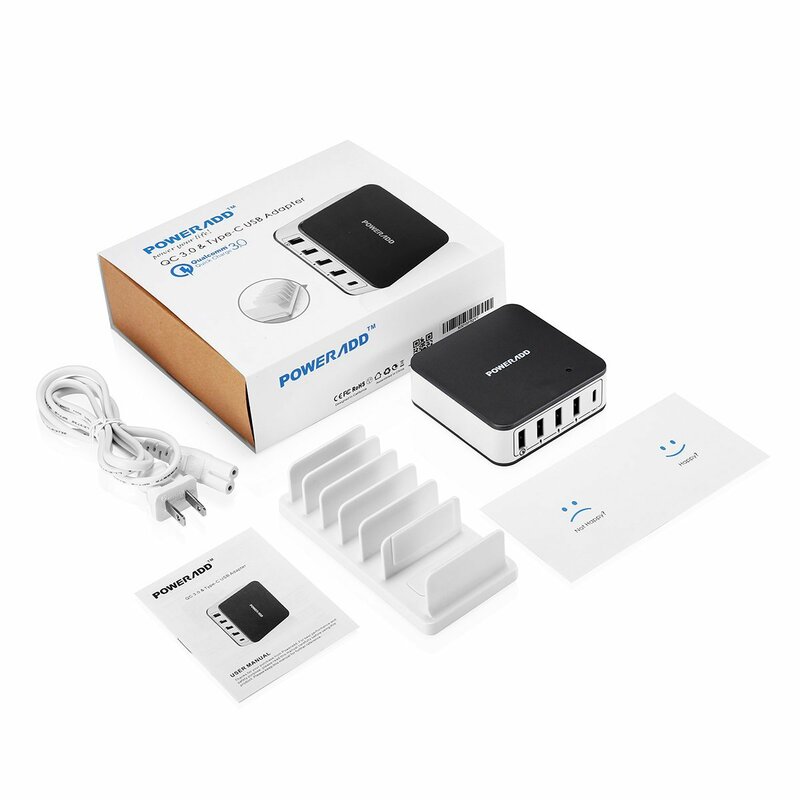 It can identify your device and offer the fastest available current accordingly for the device. 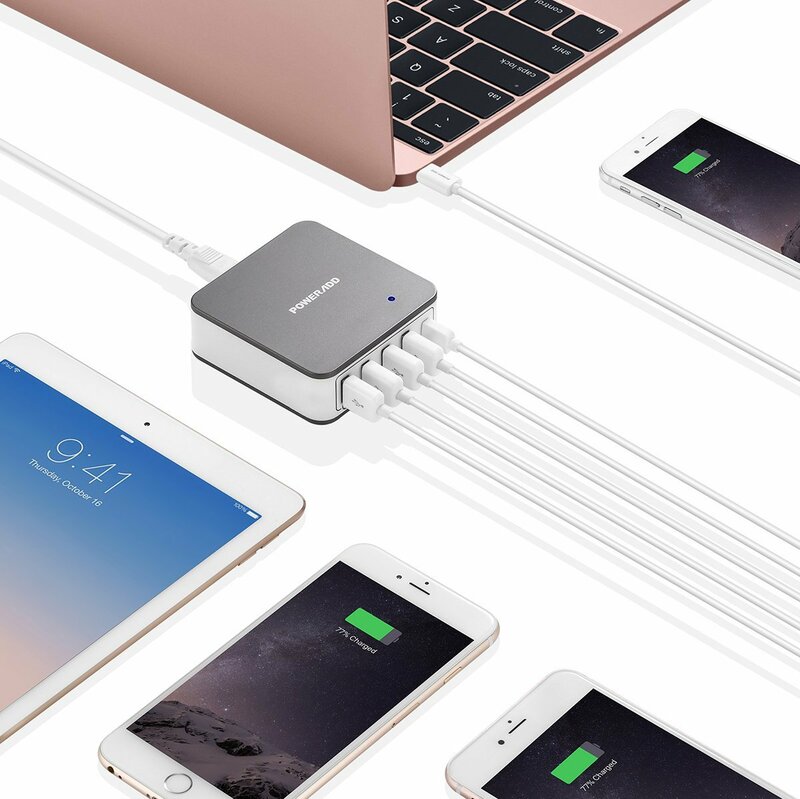 Maximize charging speed up to 2.4 amps per port for iPhone, iPad, Samsung Galaxy smartphone. — Safety and Warranty: Fire-resistant outer shell and built-in safety system for total protection . The next generation of USB tech – small reversible connector designed to support a new wave of faster, more efficient power delivery, 10x faster data transfer and sync speeds than USB 2.0. 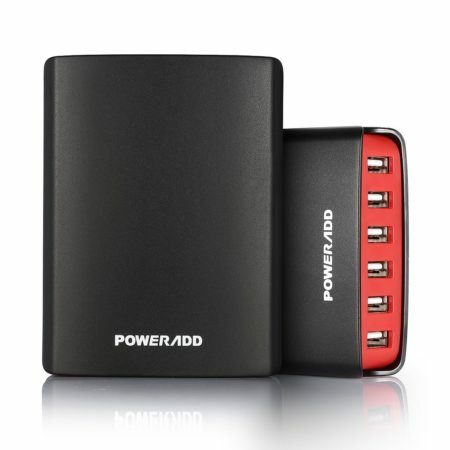 Compitable with most type-c port laptop. 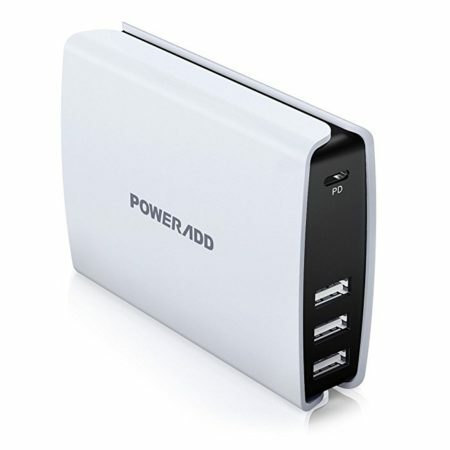 Up to 4 times faster than universal chargers. And it is twice as fast as Quick Charge 1.0, faster than Quick Charge 2.0 by 38%. 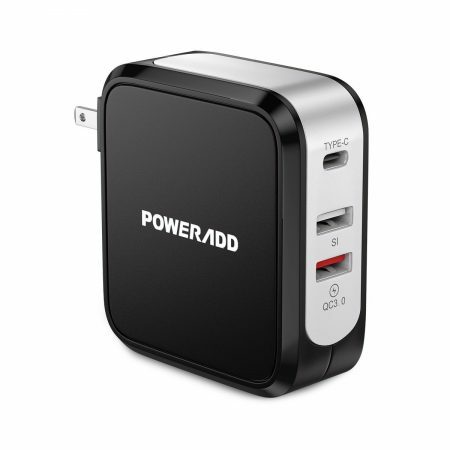 Quick Charge 3.0 is a brand new generation of charging that can largely save your time charging your devices.